Money fascinates almost everyone and poker players are no exception. True, real money poker players look at poker as an investment. They often tend to invest their money on tournaments where there is big money to be won. Said that, the constantly growing prize pools across various Indian poker tournaments such as Deltin Poker Tournament (DPT) should definitively motivate more and more players to join in the poker industry. It has been noticed that bigger tournaments with bigger prize pool taking places at the online felt and live felts have been successful enough to attract more players into the game. This is quite evident from the recent statistic of India’s largest poker site Adda52.com. The site has been attracting both professional as well as recreational poker players. From a few registered players in the past years, the site has over 9 lac registered poker players today. In poker, diversification plays a key role. To build up more craze around the game of poker, Indian poker rooms, including both online and offline, need to come up with some new and interesting offerings for players by introducing various kinds of tourneys. The variety of tournaments along with interesting offers like bonuses and free giveaways will not only cater to the varied needs of players, but also build up more excitement around the game, which may ultimately help to fuel the growth of poker industry in the country. Some tournament varieties that poker rooms should consider may include High Roller, Super High Roller, Deep Stack Turbo, Super Deep Stack Turbo, Monster Stack, 6 Handed Turbo without Antes, PLO 6-Max, Heads-up Championship, Hyper Turbo, Shootout, Team and Greed event. Being globally accepted by players, these types of tournaments with varied buy-in and prize pools should attract different types of players into the game and take it to a next level in India. Poker players need global exposure to hone their talent and skills in the game of poker. Sending players to various international poker events could be a great idea to contribute to the growth of poker popularity in India. 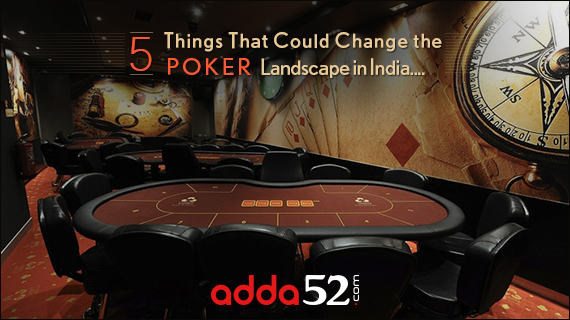 It is perhaps for this reason that India’s largest poker site Adda52.com is sending players to participate in various international poker events. True, the poker site organizes various types of online satellites from time to time to qualify and send Indian poker players to participate in various world famous poker tournaments to allow them compete with the best international players and thereby improve their game. In the past, many players have qualified through the website for the Asia’s biggest and richest poker festival WPT. This time around, the poker site is running satellites for the WPTN- Cambodia. Indian players, who wish to compete and win big can take part in these satellites and win ticket to WPTN- Cambodia starting from January 2, 2017. Mobile poker apps can also be an effective way to reach out to more and more players and thus promote poker in India. They provide a fast-paced gaming experience for poker players, as they come with some interesting new features and interface, which makes them suitable for both newbies and experienced players to enjoy real money poker on the go. Most mobile apps for poker have in-built hand ranking tool to show hand strength. The modern apps not only have functions such as Call, Raise, Fold, Check options, but also feature ‘Auto-Muck’ function. What is more, some apps also come with ‘ Chat’ option, which means players can have chat with each other while playing the game. So, the introduction of some advanced apps can not only improve gaming experience but also add to the craze of poker in the country. Though players already enjoy mobile gaming in the country, some more advanced mobile poker apps are still needed to enrich the online gaming experience in the country. To capitalize on the growing craze for poker and removes taboos surrounding the game, poker companies should go ahead with some awareness programs to educate masses about poker, the game of skill. While many have accepted poker as a game of skill, but there are still people who find playing poker as taboo. Some good awareness programs targeted at these people will not only help poker companies to establish poker as a game of skill , but also remove misconceptions revolving around the game. Currently, there are many online poker rooms running different poker awareness programs. Adda52.com too conducts free tourneys at colleges and creates digital content for the bright minds to understand poker as game of skill and remove misconceptions around the game.